“Transformers: The Last Night” is actor Mark Wahlberg’s third appearance in a Bay-directed movie. He first worked with him on the true life tale of 2013’s “Pain and Gain,” which also featured The Rock (Dwayne Johnson) and Anthony Mackie (“The Hurt Locker,” “Captain America: The Winter Soldier”). I gave it a grade of a C on the A-F scale. 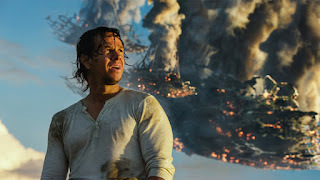 He then joined the ‘Transformers’ universe in 2014, playing Cade Yeager, an inventor residing in Texas who discovers Autobot leader Optimus Prime in a delapitated barn. It was another C+ entry into a franchised that has just been average at best. What is ironic is the fact that Yeager’s daughter is off at school, so Bay weaves in a 14 year-old girl, Isabella (Isabela Moher) into the storyline. He tries to bring further credibility to his popcorn flicks by bringing in Oscar-winner Anthony Hopkins. Bay has done stuff like this before, bringing in Oscar-winner Frances McDormand into the Transformers universe with a government higher-up in “Transformers: Dark of the Moon” in 2012. Her appearance added nothing to the lackluster franchise but just give it a slice of credibility by just having her name and face in the flick. Also making an appearance is character actor Stanley Tucci, who appeared in “Age of Extinction” as wealthy industrialist Joshua Joyce. In “The Last Night,” he is Merlin, who aided various Transformers in their plights here on planet Earth. His directorial debut with “Bad Boys” But every once in a while I get surprised, like 1995’s the Martin Lawrence-Will Smith team up was the epitome of style over substance. He treated sow motion as an overused device to no end. As much as I dislike his movies, at least Bay is thinking outside the box a little. Last year witnessed him trying something different with “13 Hours: The Secret Soldiers of Bengazzi.” I did not really care for that one either, giving it a C+ on my A-F scale. Despite all my complaints about his work, Bay’s “Transformers: The Last Knight” is a definite must for the big screen and worth the extra money for the 3D IMAX experience. just to let you know, Cade found Prime in a deserted movie house and then took him home to his farm. Josh Duhamel was not in Transformers 4.